Something I do appallingly at is going the gym. I fully admit I hate exercise. I know, I know, its purely down to laziness, but its true, I'm just not someone who likes exercising. Pounding away on a treadmill in a traditional gym is not really my scene, so when asked would I like to try a new type of exercise class, my eyebrows may have shot up sky high in questioning. Me? Willing exercise? However this turned out to be just that little bit different. Think club meets healthy. Don't know what I'm on about? Take a live DJ mixing the heaviest Drum and Base tunes, with he help of a freestyle rapper, and combine with some serious east London moves made into an exercise routine, and there you have an idea of Ravercise. 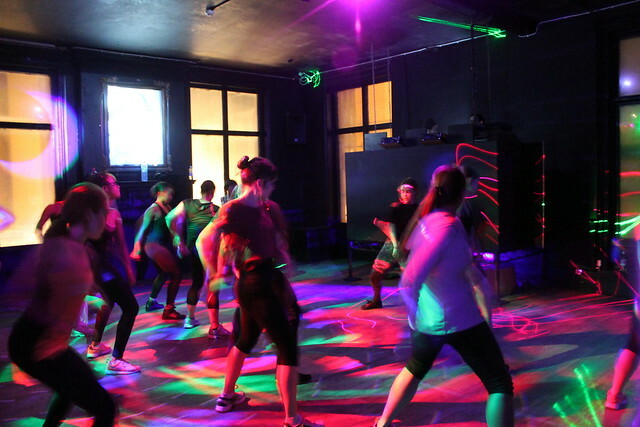 Hosted in a super cool Shoreditch bar, Ravercise has been featured everywhere from Time Out to BBC Nighnight. Who knew the 'running man' could be good for you- well clearly you Londoner's do! Miley Cyrus eat your heart out, my twerking is for real! The class is 1 hour long, and its seriously intense. I have honestly never sweated s much in my life. I told you, there would be no glamour. The class is made up for 5 minute routines. Expect sweet Drum and Base tunes being mixed in front of you by the DJ, while you try and keep up to some serious grinding moves. Think low down squats mixed with some high energy kicks and thrusts. In my naive head I thought, meh, 5 minute routines, piece of cake. Oh how I was wrong. Don't plan any activities after this I will warn you right now. The only date you'll be having is with your bath and bed! The next day I had that muscle burning sensation, and yet I was still humming those sweet tunes- I never get that after a normal gym class. So if your looking for a high energy class mixed with underground style- this is for you. So is this the start of the new healthy me? Well maybe... so long as power lifting those burgers counts too. Looks like great fun! I used to hate exercise but I think its all about finding what's right for you. At the moment I'm doing the Turbo Fire programme which is also high energy dance cardio. I prefer to do exercise at home, then I don't have to face the elements. Something like ravercise would make me leave the house though!! Ah this looks perfect!! Was it an evening class you went to? Ha that actually seems like to much fun! I do love pilates and yoga, and I've recently gotten into going to the actual gym as well. Very different from raving though! I know Frame in Shoreditch does a similar class. This is so my scene! I used to do this in my flat on my own. I would actually get into my gym kit, turn the music up and just dance around the apartment thinking I was Beyonce. It's amazing the moves you come up with when no one's watching!